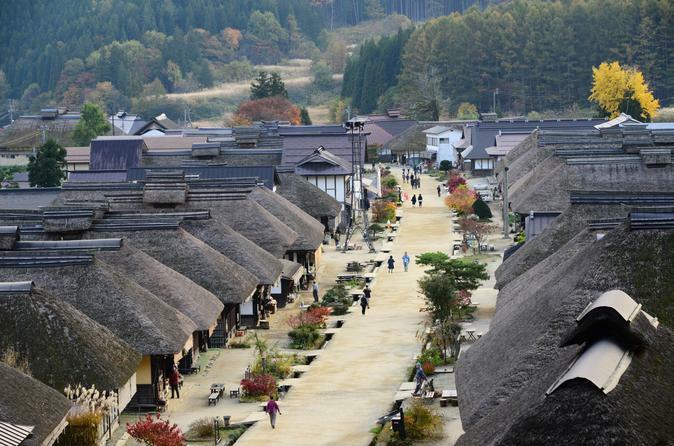 Explore Ochijuku, the traditional and nostalgic town in Fukushima area. Also, you will have a time to visit Nikko on Day 2. Please receive a train ticket at the hotel your staying in Tokyo. Local supplier will ship a ticket for round-trip (Asakusa-Aizutajima, and Nikko-Asakusa). Also, detailed information such as direction will be provided by the local supplier, so please simply follow the direction. If you worry about the direction, you can book this with assistant option. On the first day, after you arrive at Asakusa station, you will take a limited express train towards Aizu-Tajima station. Then, change the train and towards to Yunokamionsen station. A taxi driver will be waiting for you at the Yunokamionsen station with your name board, so please simply tell your name to the driver, and he/she will take you to Ochijuku, the traditional and cultural town. After having lunch on your own in Ochijuku, please check in to the accommodation. If you are with an assistant, the assistant will kindly take you to your accommodation. Even without an assistant, all detailed information such as an appearance of the accommodation will be provided by the local supplier, so there is no hassle to find. Ouchijuku, prospered as a post town during the Edo period and Yunokami Onsen, blessed with rich natural, and hot spring are located in Shimogo-cho. Ouchijuku became one of the most famous sightseeing spots thanks to houses with thatched roof that have been there since the Edo period. There are 48 houses and 3 of them are inns, and the others are restaurants or souvenir shops. At all of the inns, restaurants and, shops are not only for business but also housing for the owners. After a relaxed night in Ochijuku, you will move to Nikko area , which is known as a great cultural region the following day. Taxi driver will come to your accommodation at 9:00AM and take you to Yunokamionsen station. Take a train towards Aizu-tajima station and then change to the train that you took on Day 1. That limited express train will take you to Nikko station. After you arrive at the Nikko station, please go to the tourist counter (Detailed appearance will be followed), then please receive a coupon for the Zazen meditation. Your name will be listed at the counter, so you can simply tell them your name. What you can experience is the rare opportunity in Nikko is Zazen meditation in the Rinnoji temple, which is known as one of the world heritage temple. Zazen experience starts from 2:55PM at Rinnoji temple, so please enjoy local lunch near Shinkyo bridge. After the Zazen experience, you will have a time to explore the Nikko region. Afterwards you will ride a Limited express train for return departure from Nikko station at 5:23PM, and the tour will conclude at Asakusa station at 7:15PM. Special Offer - Book by March 31, 2018 to save up to 50% off our previously offered price for all tour options! - Book Now!